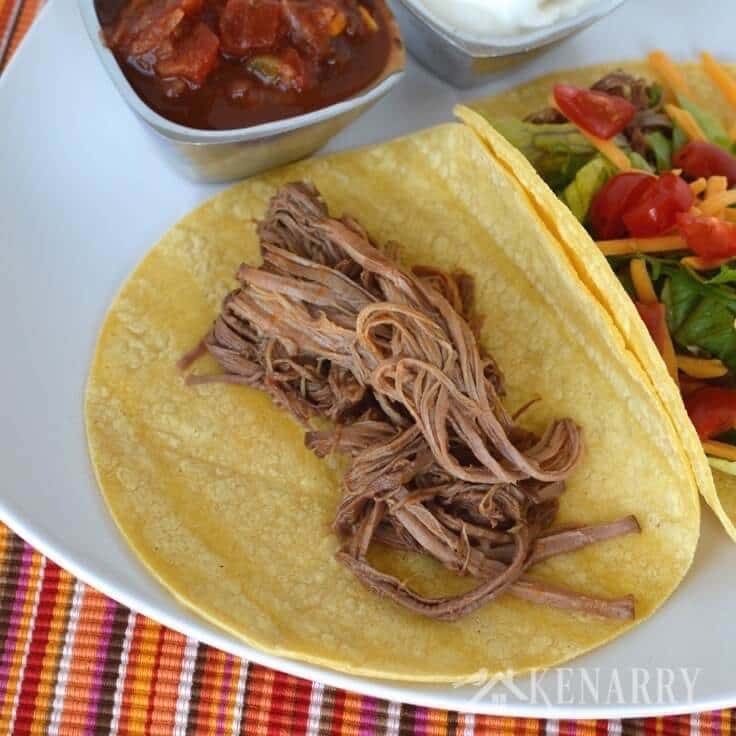 Enjoy Mexican food for dinner tonight with this delicious shredded beef recipe for slow cooker tacos. 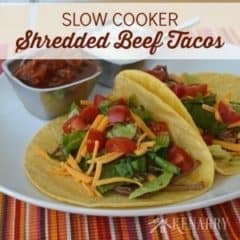 Slow Cooker Shredded Beef Tacos are so easy to make and have only 4 ingredients. In our home, “Taco Tuesday” has become a main stay in our family’s weekly meal plan. It could mean we’re having chicken verde enchiladas, fish quesadillas, beef burritos, shredded chicken tacos or any other Mexican dish that comes to mind. We like to mix it up so it’s not our standard ground turkey tacos week after week. It’s become a fun tradition that our kids look forward to each Tuesday. I also find it makes meal planning so much easier when one night each week you just have to come up with an idea for the same genre of food — plus who can resist an excuse to have tortilla chips and guacamole?! 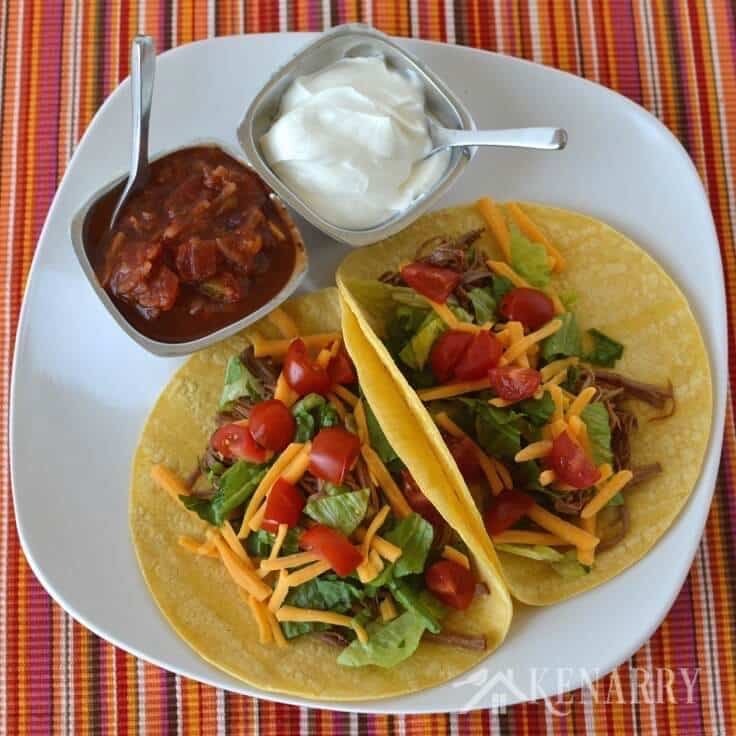 One of our new “Taco Tuesday” favorites is this shredded beef recipe. 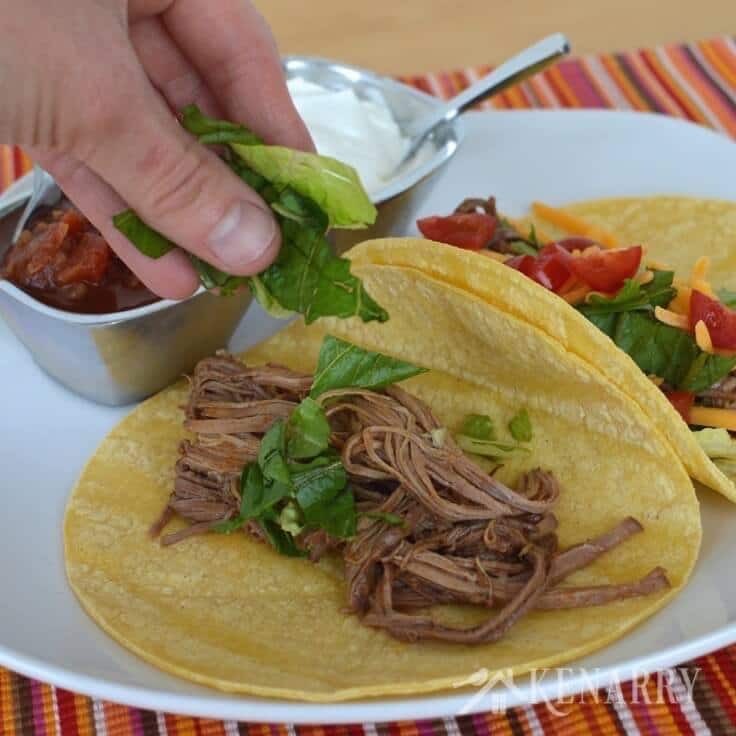 I originally shared this shredded beef recipe on Cinco de Mayo at Belle of the Kitchen for our latest Ideas for the Kitchen exchange. While I was there, Ashlyn was here sharing her Creamy Salsa Chicken Verde Enchiladas. Both of these recipes are very easy to make and would be perfect if you’re throwing a Cinco de Mayo party for a crowd or just having a quiet “Taco Tuesday” at home with your family. 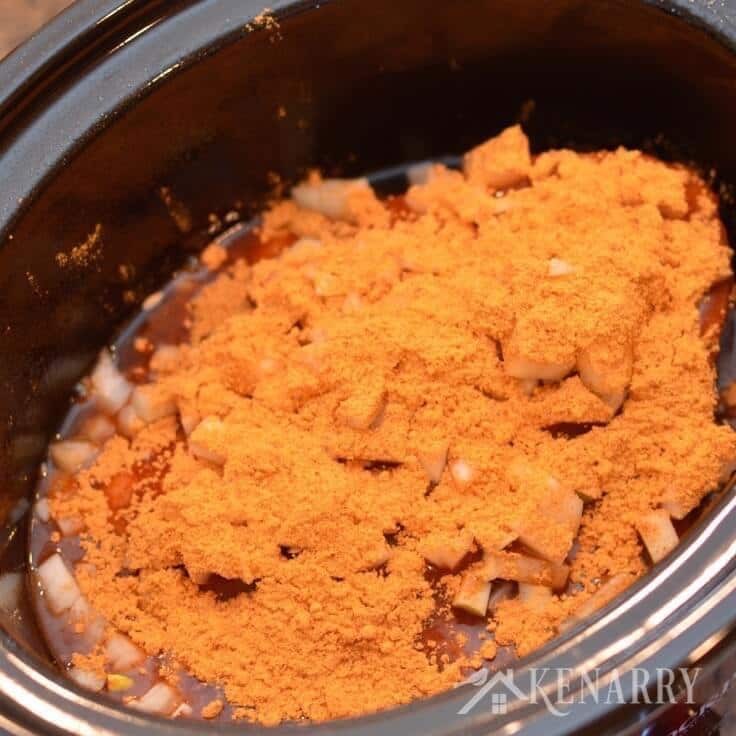 To make this shredded beef recipe, just put a large beef roast in your slow cooker, top it with some chopped onion, dry taco seasoning and a can of enchilada sauce and let it cook all day. It’s really that simple. 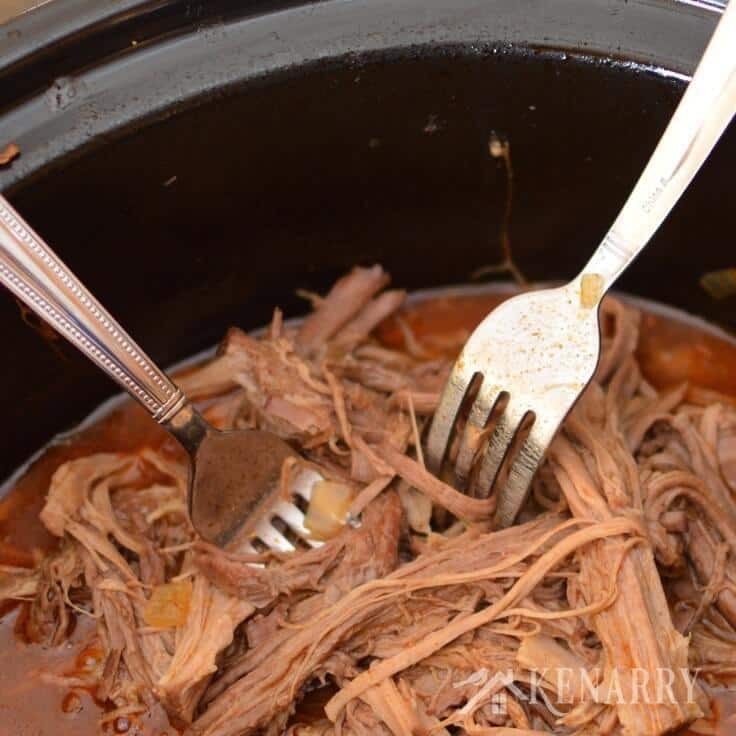 Once the beef roast has fully cooked, all you have to do is shred it apart with a couple of forks. The longer you let it cook in the slow cooker, the easier it shreds. Once you’ve prepared this shredded beef recipe, you can serve it on your favorite type of tortillas. I served the shredded beef on corn tortillas, but my husband Kent thought it was even better with flour tortillas. 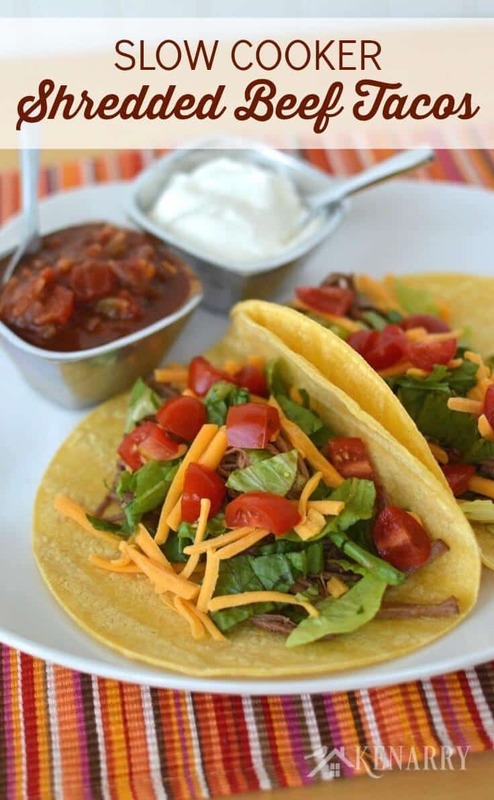 Top the shredded beef with leaf lettuce, diced tomato and cheddar cheese along with a side of salsa and sour cream and you’re ready for a fiesta! Trim the fat off the roast and then place in the bottom of the slow cooker. Pour the can of enchilada sauce over the beef roast. Add the chopped onion and sprinkle with taco seasoning. Cover and cook on high for four hours or low for 8 hours. Shred the beef with two forks. 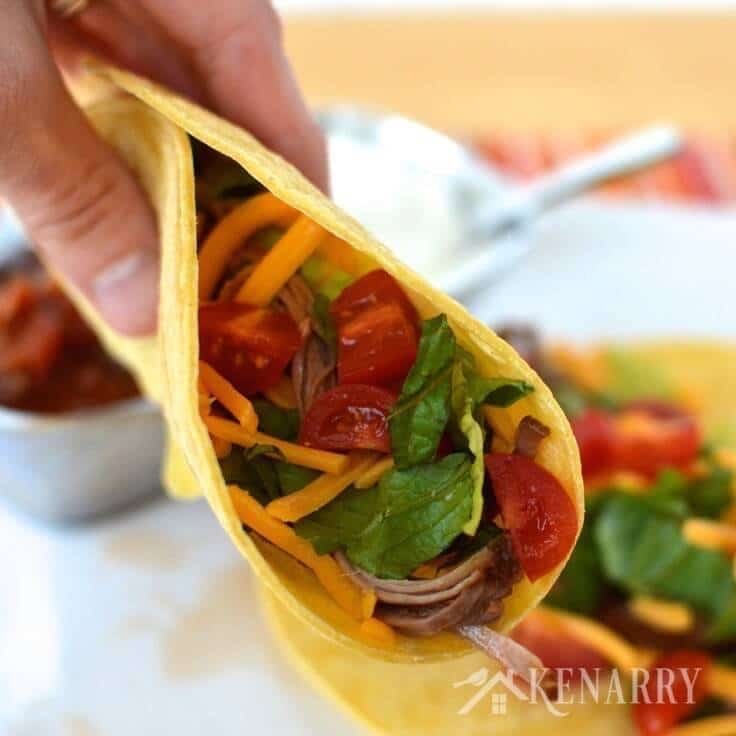 Serve on tortillas with lettuce, tomato and cheese. Enjoy! Use shredded beef instead of ground taco meat in burritos, enchiladas, quesadillas or a Mexican casserole. Serve it as a sandwich on a large bun with a slice of cheese and sautéed onions. Put it on toasted bread. Cover with shredded or sliced cheddar cheese and bake in the oven for an open-faced shredded beef melt sandwich. Shredded beef would also freeze well to save and use in future recipes for easy weeknight meals. Does your family celebrate Cinco de Mayo or “Taco Tuesday”? What’s your favorite Mexican dish? Please comment below and share. We are always looking for new ideas. Oh yummy!! 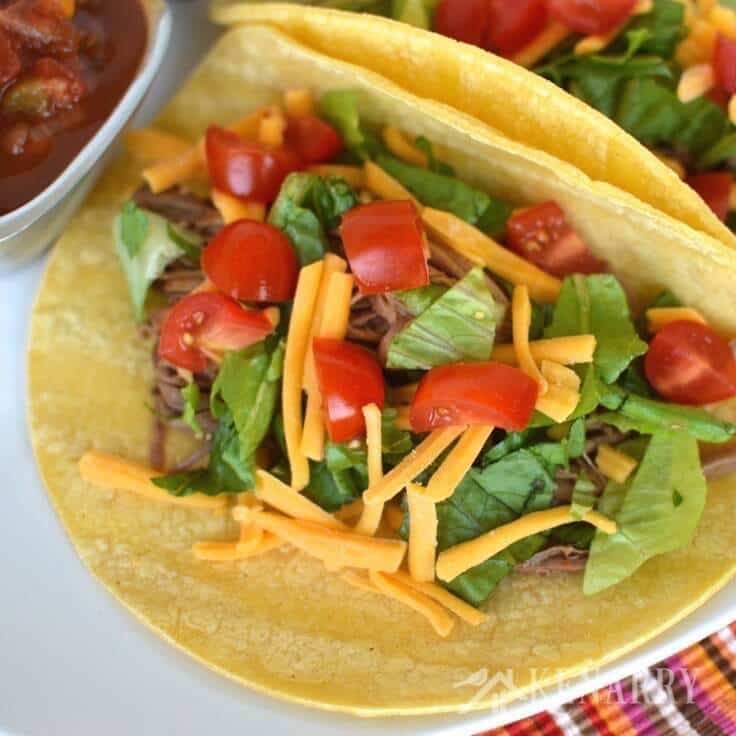 We are always looking for new slow cooker recipes since we usually end up doing the same couple ideas (pulled pork, stew, and curry) but I never thought to make tacos with it! Such a good idea 🙂 Mmm! I know what you mean, Erica. We often have the same “go-to” recipes too. I’ve never thought of making a curry-based recipe in my slow cooker, though. Great idea! It’s super duper easy to make, Jamie. Those are my favorite kind of recipes too. 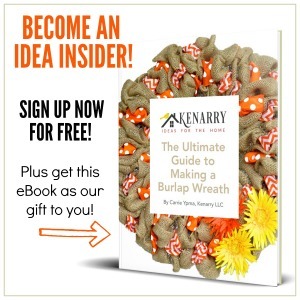 Thank you so much for pinning our recipe. I’ll definitely have to give this a try soon, especially since it’s a slow cooker recipe which are my favorite kind of recipe 🙂 We eat a lot of tacos at our house but they’re almost exclusively ground beef tacos. It’d be nice to have a little change of pace. Slow cooker recipes are my favorite kind too. You’ll definitely love this one as a way to shake things up from your usual ground beef tacos. Enjoy! !